mrs. joyce sherman (CENTER OF FIRST ROW STANDING), assistant minister of preventive services FOR LIBERIA’S MINISTRY OF HEALTH AND SOCIAL WELFARE, LAUNCHED THE LIBERIA NCDI POVERTY COMMISSION’S REPORT AT A WORLD DIABETES DAY EVENT AT mohsw HEADQUARTERS IN MONROVIA. COMMISSION CO-CHAIR DR. FRED AMEGASHIE (3RD FROM RIGHT IN FIRST STANDING ROW) PRESENTED KEY FINDINGS FROM THE REPORT. 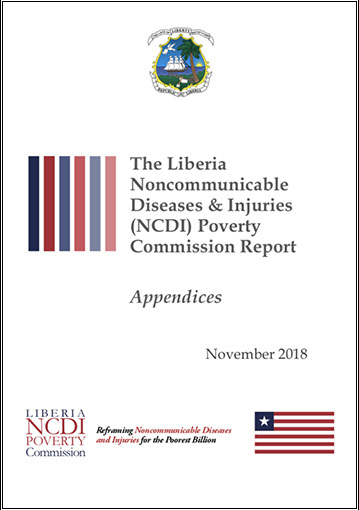 The Liberia NCDI Poverty Commission’s report was officially launched on November 14, 2018, at a World Diabetes Day event at the headquarters of the Ministry of Health and Social Welfare in Monrovia. The event was preceded by a public parade from the stadium to the Ministry. Mrs. Joyce Sherman, Assistant Minister of Preventive Services, opened the proceedings and launched the report. She was joined at the end of the event by Minister of Health Dr. Wilhelmina Jallah. Dr. Fred Amegashie, who serves both as NCD Director for the Ministry and co-chair of the Commission, presented key findings of the report to an audience of more than 150 people. Participants included the World Health Organization’s country representative, other development partners, the Lions Club, patient advocates, civil society organizations, clinicians, students, and local media. Other speakers included: Dr. Patrick Ulysses (Executive Director of PIH-Liberia); Dr. Gene Bukhman (co-chair of the global Lancet Commission on Reframing NCDs and Injuries for the Poorest Billion and Director of PIH’s NCD Synergies project), who spoke via video; Dr. Neil Gupta (Director of Policy for NCD Synergies); and Dr. Mesfin Zeblo (WHO Country Representative). Click on the images below to access the full report and the report appendices.